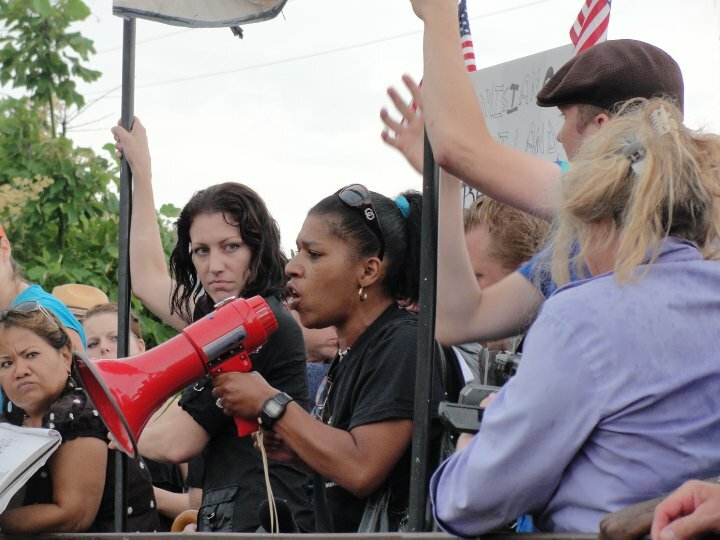 As part of the SEIZE BP Campaign’s first national day of action, we staged a rally in the university town of Hammond, Louisiana, which is mid-way between New Orleans and Baton Rouge. 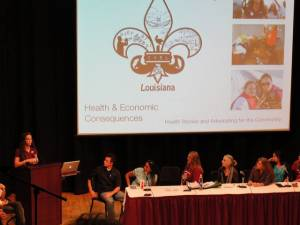 When I was interviewed by NBC 33 out of Baton Rouge at this event, I predicted that some of the worst effects of the environmental crisis would be felt by the oppressed nationalities living in the coastal areas. I was thinking mainly about African American, Latino, and Indochinese workers (large numbers of Vietnamese and Cambodian immigrants, for instance, are involved in the fishing industry here). I was referring to a general pattern of environmental racism, with which we are familiar in Louisiana. Native American tribes in southern Louisiana continue their struggle against Big Oil after decades of land destruction. The Choctaw, Chitimacha, Houma, Attakapas and Biloxi tribes, all native to the Gulf marshes, have seen the oil from the BP spill destroy their fishing grounds and livelihoods. Then there is the Atakapa Ishak tribe of coastal Louisiana. Here is a moving video about their plight. These effects – brought about by a multinational corporation and the U.S. government – are nothing short of environmental racism, and are part of the continuing national oppression of North American tribal peoples, whose right to self-determination has been brutally undermined since the arrival of European conqueors. 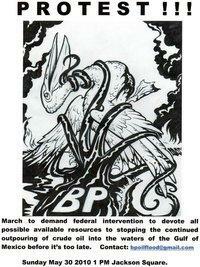 The Seize BP campaign has called for more national days of action this week. Some have happened and many more are planned for tomorrow (Saturday the 5h). Many cities in the South are holding demonstrations (along with cities all over the country) to demand the seizure of BP’s assets. The campaign was even mentioned on CNN recently. The oil spill has now reached Florida and is likely going to continue to spread. Below is a partial list of newly announced actions. Details for additional events are still coming in and being compiled, so check our website regularly for updates. Thursday, June 10, 4 p.m. to 5:30 p.m. The Aquarium, which claims its mission is “to instill a sense of wonder, respect, and stewardship for the Pacific Ocean, its inhabitants, and ecosystems” just took $1 million from oil criminals BP and unveiled a “BP Sea Otter Habitat.” This sickinging double-standard shows the utter bankruptcy of the Aquarium’s board of directors and attempts to provide cover for BP’s crimes. Saturday, June 5 at 2 p.m.
Bring signs and loud voices. Tuesday, June 8 at 5 p.m.
Friday, June 4 at 2:30 p.m.
Picket along the sidewalk in front of station. Bring signs or pictures. Only a few will be made by organizer. Thursday, June 3 at 5 p.m.
Saturday, June 5 at 1 p.m.
Saturday, June 5, 2 p.m. to 4 p.m.
Saturday, June 5 at 11 a.m.
Saturday, June 5 at 3 p.m. Corner of Bearss and N. Florida Ave. Arrive at the BP station with signs, posterboards, megaphones and demand that BP end this oil spill now and demand the government seize BP’s assets! Enough is enough! Bring your signs, banners and voices of protest! Wednesday, June 2, 7 p.m. – 9 p.m.
Meeting for Louisville-area residents to discuss how they can respond to this overwhelming ecological catastrophe. Friday, June 4 at 5 p.m.
Wednesday, June 9 at 5 p.m.
Sunday, June 6 at 10 a.m.
Flamingo and Maryland Parkway intersection. Demonstration at one or more corners of the busy intersection. Bus stops there going all 4 directions. Will pass flyers to bus riders and pedestrians. Traffic flow should be busy. Volunteer Meeting: “BP’s Gulf of Mexico Disaster: Who will pay the price?” Hear presentations about the case for seizure and find out how to get involved in the Seize BP campaign in Syracuse. Sunday, June 6, 4 p.m. – 8 p.m.
Friday, June 4 at 10 a.m. Contact: Facebook page for more info and to rsvp to event. Friday, June 4 at 4:30 p.m.
At 1:00 pm on May 30, hundreds of protesters gathered in the Washington Artillery Park, known locally as the “amphitheatre,” the performance space across from Jackson Square, next to Cafe Du Monde. The space is directly across the street from New Orleans’ historic St. Louis Cathedral, along the Mississippi riverbank. People from across the state gathered to take part in the BP Oil Flood Protest. They came out despite rain which lasted for a good part of the day, including the entirety of the protest. The event lasted for several hours. Speakers included protest organizers; the famous New Orleans musician, Dr. John; George Barisich, president of the United Commercial Fisherman’s Association; an organizer from the Oily Hair Project (an organization working for the restoration of the Gulf); Phyllis Montana-Leblanc, an African American New Orleans woman featured in Spike Lee’s documentary When the Levees Broke and actress in the HBO series, Treme, which is about post-Katrina New Orleans; along with numerous representatives of local grassroots organizations and ordinary working people from around the city. Many speakers stressed the importance of holding BP accountable for damages and the necessity of transitioning to cleaner energy sources. Several speakers expressed the view that corporations like BP have gotten rich by exploiting the workers and natural resources of the Gulf, but that little of the wealth generated has made it to the masses of working people living in the region. One even suggested that Louisiana is an internal colony of the United States, a statement met by vigorous applause. Roughly 600 employees of Delta Pride Catfish, Inc., mostly African-American women, may go on strike soon. If the contract the company has offered — using a notorious union-busting legal firm at the negotiating table — is rejected, this would be the second strike against Delta Pride Catfish. The first strike in 1990 is looked upon as a landmark in labor history. Delta Pride Catfish, a Mississippi company, is paying employees a mere $8 to $9 an hour. They haven’t had an increase in four years. The company has offered a contract that is atrocious. It would establish a seven-day work week, reduce seniority benefits, eliminate overtime, abolish severance pay should the company close, triple employee contributions to company health insurance over three years, and allow the company to outsource jobs and double the new hire probationary period — among other things. United Food and Commercial Workers Local 1529 has been in contract negotiations with the company for more than a year. This isn’t the first time the company has received attention for its highly despicable, racist and sexist treatment of Black women employees in the mostly poor Delta region. In 1990 a successful three-month strike took place against the company. The issues then were adverse health effects of speed-up, a five-minute time limit on lavatory use, low wages and 10- to 13-hour workdays. The strike was the largest of Black workers in Mississippi history and saw the civil rights and labor movements join together. Boycotts were called and scabs were brought in. A company official even threatened a striker with a gun. The small gains achieved at the time, such as a 75-cent raise, were enough to create a lasting tension between Delta Pride Catfish and its employees. Although earlier reports suggested a vote on the contract in the third week of May, union representative Leon Sheppard Jr. spoke with Workers World by phone on May 17 and confirmed that a contract ratification vote as well as a strike vote would take place on either May 26 or 27 and that there have been no further negotiations.